When it comes to weddings, a ribbon is just one of those materials you can neglect. It gives such a perfect, subtle touch of elegance and style, that it’s great for making all sorts of decorations starting from wedding invitations to even cake decorations. 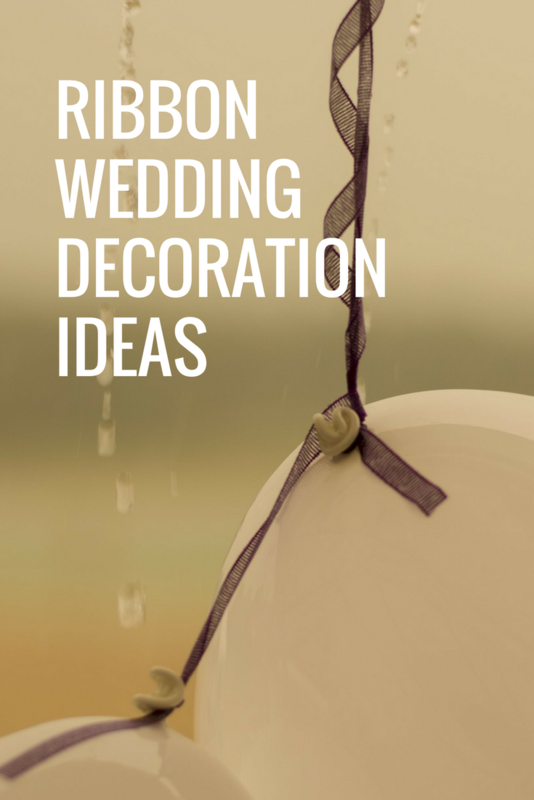 Here are some creative ways you can use ribbon for wedding decorations. It all starts with the wedding invitations. You want them to look perfect and to match the style you have planned for the wedding venue. This way it will all look as if it’s a part of one nice theme. The most common and perhaps the easiest way to use ribbon for wedding invitations is to simply tie a nice bow around each invitation. You could go with a narrow ribbon, but if you want a large bow that really stands out, use a wider piece of ribbon. Satin ribbon is a perfect choice for this occasion. If you want to make custom wedding invitations, you could cut hearts or any other shape on the front and glue the ribbon beneath, so that it’s visible through the cutout shapes. Here’s an idea how to make your wedding look colorful. Use satin ribbon strips! The ribbon already comes in strips, all you have to choose is the width. Since you want the ribbon to be noticeable, choose the ribbon around 1 inch. You could also go for 1.5 inches wide ribbon. You’ll also have to choose the colors that will match the entire decorations of the venue you have imaged. Ribbon strips can be used for different purposes here. Start by decorating the chairs. Simply bundle a couple of pieces of ribbon and attach them to the chairs. You could also decorate the wedding isle to match these chair decorations. When it comes to the interior, satin ribbon strips can hang from the ceiling, or you could attach them to the windows. You could even make a banner with strips hanging and use this banner to decorate the table for the bride and groom. This will make their table pop instantly, especially if you use vivid colors. These tiny pieces of decorations are traditionally a must-have item on most weddings. They look wonderful on wedding photos and yet they can make such a tremendous influence if you want to go for a specific theme. The ribbon is frequently a part of wedding corsages. It can be used as a piece you use to tie the corsage, in which case grosgrain ribbon is a better choice, as it’s easier to tie than satin ribbon for example. Satin ribbon is perfect if you want to make elements of the corsage itself, such as a ribbon flower, or perhaps a ribbon bow. The choices are endless because you can combine ribbon with many different things, such as flowers, artificial flowers, felt flowers or bows, lace, burlap, etc. Even if you haven’t used ribbon as a material for wedding decoration, here’s where you will most definitely use it. The ribbon is an inseparable part of a wedding bouquet. Its main purpose is to hold everything together as the flower branches are wrapped beneath. Besides its purposefulness, the ribbon can also look quite nice on a bouquet. You can either go for a shorter piece that simply wraps around the bouquet, making it simply a practical solution. You could also use ribbon to tie a bow around the bouquet. Another cool idea is to use long ribbon pieces and leave them hanging from the bouquet. This can look quite nice on the photos, especially if it gets a bit windy, and the ribbon pieces wiggle around. There are so many different ways to decorate a wedding cake, but what has recently become popular is using satin ribbon and other non-edible decorations. Even though they don’t add up much to the taste, these decorations can make even a plain frosting cake look much more elegant and classy. The ribbon is usually tied around the lower part of each layer. Using a contrasting color is a perfect way to highlight each layer of the cake. Of course, it’s always a nice touch if the ribbon color on the cake matches the rest of the wedding decor. Besides a ribbon strip, the ribbon can also be used to make a topper for the cake, such as a small flower bouquet which would replicate the one bride is carrying. Burlap is a perfect material for an outdoor or a rustic wedding. It gives that special old and rustic look. With a nice touch of lace or satin ribbon, this rustic look can suddenly appear quite elegant and worthy of a wedding ceremony. For an outdoor wedding, you could decorate tables with burlap, starting from burlap utensils holder, to a burlap table cloth runner. Adding a piece of lace would make everything look more elegant, especially if the lace color matches the bride’s dress. To complete this rustic look, tie a large burlap bow on each chair. There are many variations here. As you get creative you can adjust each piece of decor to make it look perfect as a whole. Burlap can also come in handy for centerpiece decorations, or to even decorate glasses, candles or other items placed on the tables. What’s your favorite ribbon wedding decoration idea? Wow, I love these ideas! I especially like these long ribbon pieces hanging from the bridal bouquet. The images look wonderful. I love the bridal bouquets too 🙂 In general, I much prefer satin ribbon for weddings, although I admit burlap ribbon can also look quite nice, especially for an outdoor wedding. This burlap decorations look quite interesting, I never knew this material could look so elegant.